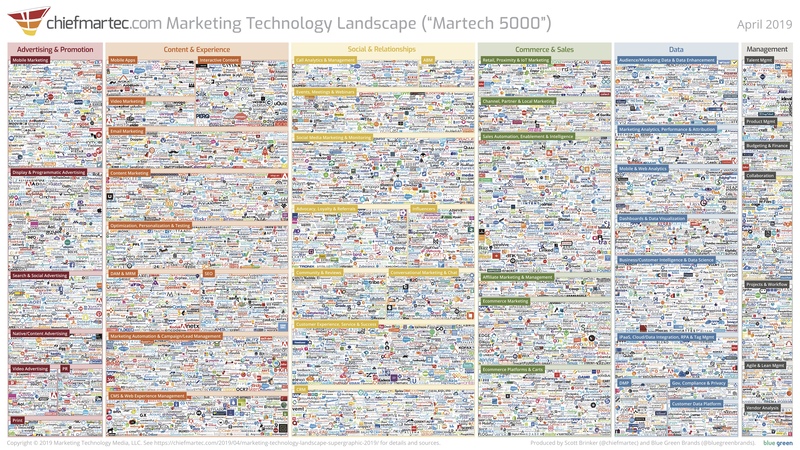 Scott Brinker published his 2019 Chief Martech eye chart and it now spans 7,040 companies, up 211 since last year. While the industry continues to grow, the rate of growth appears to have moderated. Between 2014 and 2018, the industry was adding over 1,000 companies each year with the biggest jump for the 2018 chart (1,800). The super-graphic is available to the public and may be reprinted at up to 1600 x 900. Brinker has also made a spreadsheet available. Regionally – When comparing to national MarTech landscapes, Brinker spotted hundreds of companies on the UK, Canadian, Chinese, German, Swedish, and Finnish country charts that were absent on the 2019 Chief Martech chart. Vertical – Likewise, verticalized solutions are also underrepresented. “Each of these trends — the growth of platform ecosystems, the blending of software and services businesses, and the rise of citizen developer platforms — are birthing whole new galaxies of martech apps. Brinker lists Salesforce, Oracle, Adobe, Microsoft, and G Suite amongst the platform ecosystems, but one would also include browser extensions, mobile apps, and sales engagement platforms (technically, SalesTech, but there is a fair amount of overlap between MarTech and SalesTech these days) to the list. Brinker noted that WordPress has 54,480 plugins. Many of the DaaS and Sales Intelligence vendors covered in this newsletter are amongst the 204 vendors listed in the Audience / Marketing Data & Data Enrichment category and the 457 vendors listed in the Sales Automation Enablement & Intelligence grouping.